From 1818 to the present day, Lake Bluff has been on the move. A brief outline of village history follows. 1818 – December 3, Illinois recognized as the 21st State. 1833 – A US treaty with the local Native American Indian tribes opened this area for settlers allowing the US to sell the land for $1.25 an acre. This house was on the site of the original log cabin, built by John and Catherine Cloes in 1836. 1836 – John and Catherine Cloes, German immigrants, purchased 100 acres of farmland on the lake near Blodgett. John opened a blacksmith shop on Green Bay road. 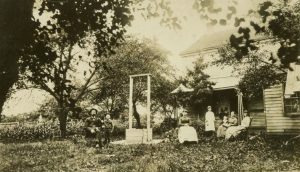 1837 – William and Mary Dwyer farmed & ran a stagecoach stop on Green Bay Road where the elementary school now stands. 1838-1849 – Green Bay road was a log road carrying stagecoaches and supplies between Chicago and Green Bay. 1850 – John Cloes and two of his sons leave to mine gold in California (John died in Sacramento). 1850 – Shields Township established. First meeting was held at the Dwyer’s Inn on April 4. 1855 – A Railroad station was built and the town, known as Rockland, developed between Green Bay Road and what is currently Sheridan road. 1866 – The Rockland Union Church was built at southwest corner of Green Bay and Rockland Road. 1870 – The Rockland School was built on the northwest corner of Green Bay and Rockland Road. 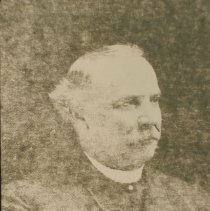 1875 – A group of Methodist clergy purchased from Ben Cloes 100 acres of land bounded by the lake, Moffett, Prospect, and Ravine Ave. They established the Lake Bluff Camp Meeting Association. 1876 – July 6th the first camp meeting worship service was conducted. 1883 – The Hotel Irving was built, a new Tabernacle was built, and an Artesian well was drilled. This well provided water for the hotel and created a 10-acre lake (Artesian park) . 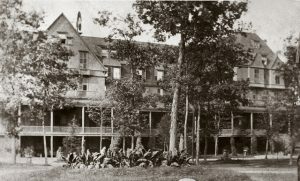 1898 – The Lake Bluff Camp meeting Association holds its last program and gives its property to the Village. 1895 – The Village of Lake Bluff is incorporated. 1900 – Lake Bluff Volunteer Fire Department formed. 1904 – The brick railroad depot is built. 1911 – The 1st Lake Bluff Fourth of July Parade is held. 1917 – Lake Bluff collects dollars to purchase an ambulance for use in France WWI. 1919 – Veterans Memorial on the village green installed. 1921 – American Legion Post 210 organized. 1923- Ravine Forest subdivision is approved and streets laid out. Subdivisions are also laid out along Green Bay Road and Route 176. 1924 – Lake Bluff Park District created. 1924 – Lake Forest High School is built. 1926 – Lake Bluff Library established. 1970s-1980s – Tangley Oaks, Armour Woods and Belle Foret are built. 2008 – Lake Bluff Elementary School opens on Green Bay Road.